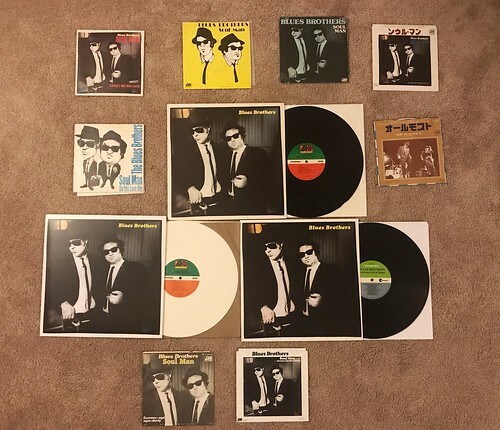 On November 28th in 1978, the Blues Brothers album Briefcase Full of Blues was released. Today marks forty years since this album came out. I was still a week away from my second birthday, but this album being released still ranks as one of the most important events of my life. Now, as a not-quite two year old, I have no memory of the day this was released. I also don't know exactly how long it was before I heard the record for the first time, but I can say that by the time I was three, the Blues Brothers were my favorite band in the world. I've asked my parents how I got into The Blues Brothers and neither one of them really seem to remember. My mom thinks she was the one who bought the record as she liked them on Saturday Night Live, but the actual music they are playing is more in line with the sort of music my dad liked a bit more. Neither one of them view the moment as life altering as I do and I wish they had been paying a little more attention to the events as they unfolded. However this record came into my life, its impact has never waned and while I've said it many, many times in the past, I don't think I would be the same person and I'm not sure I would have ever gotten so into music if it weren't for the initial spark that the Blues Brothers provided. Over the years I've listened to this album countless times. I've bought it repeatedly to have different versions on colored vinyl, remastered reissues and various singles that were released from it. I even recently bought the Japanese pressing of the LP, but it didn't show up in the mail in time to take a picture of it for today. I've reviewed this record several times on this site in the past. You can read those if you want more of a song by song account and further details of how important this record is to me. For today, I just want to make mention of this milestone and say how thankful I am to everyone that played a part in putting this record out. It means more to me than I could ever articulate.